The Embassy of the Republic of the Philippines wishes to inform the Filipino public that it has implemented an appointment system for passport renewal applications. To ensure faster and efficient service, we advise all applicants to secure an online appointment. PLEASE CLICK THIS LINK TO SET AN APPOINTMENT. Please make sure that you come to the Embassy on your scheduled appointment date and time. Passport applicants who do not have access to the internet and thus do not have an appoinment will still be entertained but they will have to wait until those who prior appoinment have been served. The passport applicants are therefore advised to secure an online appointment so you do not have to wait for a long time. 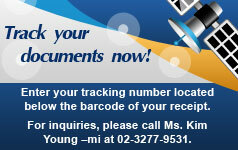 Applicants are informed that the Embassy Consular Section is open from 9:00am to 4:00pm from Sundays to Thursdays. Releasing of new passport starts at 1:00pm to 4:00pm during Sundays and 9:00am to 4:00pm during Mondays to Thursdays. 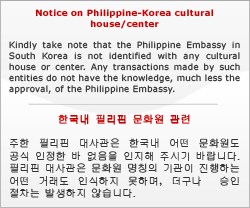 The Embassy is closed during Fridays, Saturdays and Official Holidays.